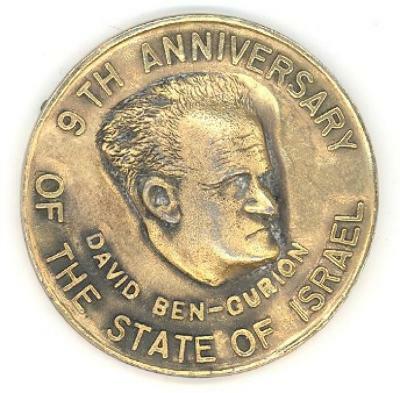 The obverse shows an almost right profile portrait of David Ben-Gurion, which is just turned slightly forward. The portrait is in very high relief. Directly under the head is DAVID BEN-GURION. Above is 9TH ANNIVERSARY and around the bottom appears OF THE STATE OF ISREAL. This medal was issued, as a souvenir, for a testimonial dinner given, on the ninth anniversary of the establishment of the State of Israel, in honor of Maxwell Abbell, Chicago real estate mogul and outstanding financial contributor to the Zionist cause. The medal measures 40 millimeters and is cast in white metal, which was subsequently bronze plated. Maxwell Abbell was a prominent Chicago lawyer, accountant, and real estate executive. Abbell was widely noted for his philanthropic activities, particularly for the benefit of the State of Israel and the Jewish Theological Seminary of America. He died on July 9, 1957, less than two months after his testimonial dinner.